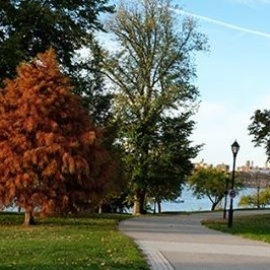 Randall's Island Park Alliance, Inc. (RIPA), formerly Randall's Island Sports Foundation, Inc., was founded in 1992 as a public-private partnership to work on behalf of Randall's Island Park, located in the East River between East Harlem, the South Bronx and Astoria, Queens. In May 2010, RIPA finished rebuilding over 60 new athletic playing fields. Randall's Island Park now has more than half of all the athletic fields in Manhattan, which will vastly increase the amount of playing time available for all New Yorkers. RIPA is working closely with the City and local community-based organizations to ensure that all the children of New York are guaranteed a much needed place to play. Randall's Island Park is home to Icahn Stadium, a world-class track & field facility, which is the only one of its kind in North America capable of hosting local, regional and national events. Icahn Stadium offers a full standard 400-meter Mondo running track flanked by 5,000 covered spectator seats overlooking the East River. Within the Icahn Stadium complex, there is a premier turf soccer field with bleachers for spectator events.